Florida Bee Removal specializes in live removal and relocation of bees in Lakeland. In addition to bee removal (including Africanized bees) we remove wasps, hornets, yellow jackets as well as bee hive and honey removal. We are licensed and insured and perform bee removal service not only in Lakeland, but the entire state of Florida. Call Florida Bee Removal whether you need bee removal services, or perhaps you have a bee swarm or yellow jacket nest on your property and would just like additional information. We have been in the bee removal business over 50 years and enjoy every bee removal adventure. You are never a bother to us, we love the phone to buzz for bees! If you are located in Florida, you come into contact with bees. It’s just a fact of life. Sadly, you don’t know if you’re dealing with aggressive bees or non-aggressive bees until it’s too late. At Florida Bee Removal, our experts are highly qualified and properly trained in safe, effective bee removal techniques. We offer same-day service at a fair price. When we can safely and effectively perform it, Florida Bee Removal prefers to practice live bee removal of the bee hive if at all possible. When we have safely removed the live bees from your property in Lakeland, we turn them over to a local beekeeper so they may be safely managed. Our goal is not to exterminate bees, rather remove the danger of the bees from your property and keep them in their natural habitat so they can continue benefit our evironment. Other stinging and aggressive insects such as wasps and yellow jackets must be exterminated and removed from the site. Honeybees will attach up to 200 pounds of brood and honey to structures in attics. The ports of entry must first be determined:. Bees enter attics from the outside of homes, sheds, and businesses. A careful examination of concentrated bee activity should be found and evaluated. The most common entry points, into attics, are: soffits, vents, and decayed siding. . A determination needs to then be made between an exterior or ceiling / floor treatment and removal. When the beehive is only in a soffit or wall, exterior bee removal can be a good option. Contrary to this; if the bee colony extends deep along attic rafters, atop the human living spaces, a ceiling or floor bee infestation resolution should prove to be more efficacious. A plastic sheet is recommended to catch the honeycombs and bees. Ceiling and floor repairs need to be effected by those trained and licensed to make such repairs. 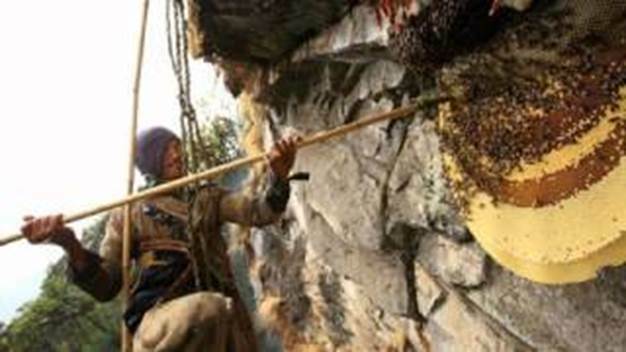 Simple eradication of the bees, without nest removal, could result in leakage of honey and a foul odor from decaying bees and brood ( similar to ammonia ). Florida Bee Removal is equipped to perform complete bee and honeycomb removal with minimal structural damage or mess.